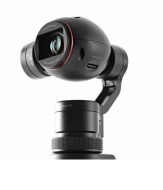 alaTest has collected and analyzed 87 reviews of DJI Osmo. The average rating for this product is 4.2/5, compared to an average rating of 4.1/5 for other Camcorders for all reviews. People really like the size and durability. The portability and price are also mentioned favorably, but there are some negative comments about the zoom and color. We analyzed user and expert ratings, product age and more factors. Compared to other Camcorders the DJI Osmo is awarded an overall alaScore™ of 95/100 = Excellent quality. With action camera juggernaut GoPro making moves to muscle in on DJI's multicopter dominance, DJI is fighting back with a portable action camera of its own, and one that can do things no GoPro can do yet. We had the chance to test drive one over the weekend, so while this is far from a comprehensive review, we did get a chance to form some opinions.